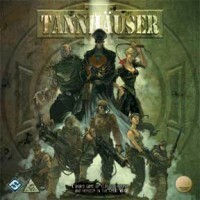 Tannhäuser is the base game in the Tannhäuser series. It features the men and women of the 42nd Marine Special Forces, led by John Mac Neal, and the mysterious and deadly Obscura Korps of the Reich locked in a struggle to recover the Obscura Cardinal Stones. The box of Tannhäuser includes everything required for two to ten players to begin playing in the u-chronic Tannhäuser universe. A look inside the world and game of Tannhauser. without a second thought, and brought it to the table immediately. Unfortunately, it failed to impress. With bizarre, anti-thematic rules, the game simply didn’t feel like two factions locked in a deathmatch as much as it felt like a puzzle game. Thankfully, Fantasy Flight Games decided to rewrite the game and release new components to make the game more accessible and thematic. I am happy to report their efforts were met with better-than-expected (at least, by yours truly) results. Gameplay: This game is all about tactics, as was originally advertised. After building a team usually consisting of 5 members (expansion packs may alter the team size), the players then assign their individual members equipment packs. This is great fun, as one arms each of their soldiers with armor, guns, occult powers, and explosives. Each team member has their own set of cards with descriptions of what each piece of equipment does, and makes it very easy to reference how they work. However, each team member will have 4 pieces of gear, and when you multiply that by 5 team members, each team ends up with 20 pieces of equipment each with their own activation requirements, and it can be a LOT to remember. Thankfully, the gear makes sense thematically and is not nearly as intimidating as it may initially seem. Once the teams are set up, deployment begins, each team going back and forth, and before long, the destruction will ensue. Due to the ability to overwatch (interrupt your opponent’s move with an attack) the entire map quickly becomes a danger zone, and movement becomes a game of risk vs. reward. Were line of sight an issue, this would become almost unmanageable, but one of the really cool things about this game is how they handle that tricky issue. Each space on the board has one or more colors, and if an enemy is in a space of the same color, you can see the sneaky critter. As mentioned before, the game is extremely tactical, with strategies changing every turn to meet movement, and a LOT can happen in one turn (almost always accompanied by sound effects that I couldn’t help but make… lots of “pew pews!” and “rattatatttatts” and “kabooms!”). Combat, and most tests, require a die roll. Here is where things get a little wonky. Fantasy Flight made the bizarre decision to make every test a matter of subtracting the “trait number” (ex. how well you can aim) from 10, then trying to roll over that number with a number of dice. We found it easier to simply try to roll under the trait number and just kept in mind that “lower is better.”Combat tends to be deadly and dangerous, and it only takes a couple of mistakes before you’ll find yourself sans a team member. Components: Truly, the components are one of the highlights of this game. The miniatures are fantastic, the maps are beautiful (if a tad on the dark side), and equipment cards are detailed, concise, and useful. All of these add to the theme tremendously. Fun: Every game is going to be subjective when it comes to this category. However, as an avid Ameritrasher, this game tickled the itch that I wanted scratched. Tactical team combat, lots of different guns and stabby instruments, evil Nazi spellcasting, and explosions. The dice, as always, can determine a game, but thankfully this is mitigated a bit with abilities that increase your odds of success and that fact that you’re rolling a number of dice instead of just one when determining successes. The sheer number of options per team member per turn could potentially be a problem for those who suffer with Analysis Paralysis, and euro gamers should clearly avoid this game. Expansions: I have to point out here that there are an enormous number of expansions for this game, mostly sold in individual packs. The base game comes with two sides (essentially Germans vs. Americans) and packs exist for the Matriarchy (Russia) and Shogunate (Japan). There is a lot of fun to be had with the base game, but if you’re going to get into this game, I have to recommend picking up a few of the packs, as they can quickly add to the replay value. This game was on my want list for a long time and I finally took the plunge. I am so glad I did. It creates an online DeathMatch feel while providing the face-to-face interaction of a board game. In addition to simulating an FPS with multiple modes (including rules for story (objective) driven mode, king of the hill, and capture the flag), this game is dripping with theme. It is a Tesla fan’s dream, but there are characters for the Occult fans too. And all wrapped up in a Weird World War II theme. Add a Review for "Tannhäuser"